First, if anything goes wrong with the single accessible voting machine, there is no opportunity for individuals who needed the special assistance to use any of the other machines in the location. The voting technique for those with disabilities is often different enough from the voting technique used by everyone else that poll workers are likely to be ill prepared and often unable to correctly explain the proper method for using these special voting systems or modes. Many individuals who require special accommodation, especially those who are older or who have hidden disabilities (e.g., learning disabilities), are unwilling to use the "disability machines," especially in front of their neighbors and friends who are among the poll workers. Finally, care has to be taken to ensure that enough non-disabled voters in other categories use the accessible voting machine to ensure that the voting pattern of disabled voters is not obvious and separable from the voting process overall. The magnitude of the problem with regard to elder voters and disability can be seen from Figures 1 and 2. Figure 1 shows disability as a function of age. As people age, the percentage of the population that experiences disabilities rises sharply. In fact, all voters will acquire disabilities if they live long enough. 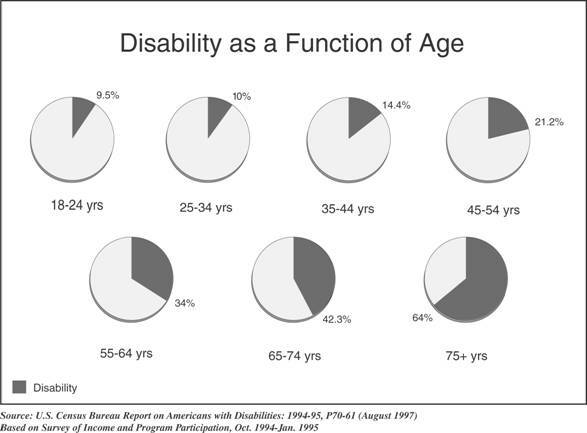 Figure 2 shows common types of disabilities by age group, and reflects a sharp increase in physical, visual, and hearing disabilities with age. Not reflected in these data is the effect of aging on cognition. The initial objective of our work was to create a single electronic voting machine interface that would accommodate all voters. Our early prototypes provided a touch screen interface with a very simple ballot layout, resembling paper ballots that voters may have been familiar with. This interface provided enhanced readability and the ability to correct. It also provided protection against overvoting and warnings for undervotes. For individuals who could not use the touch screen because of reach or because they could not see, tactile Braille marked buttons were available below the screen, allowing the voter to move through the races, as well as separate buttons to move up and down the choices in any race, to cast or cancel a vote, and to jump to the end to check a summary of their votes. Vanderheien, G.C. (2002). In using the early prototypes with older voters, it was interesting to note that many would use the arrow keys rather than the touch screen to navigate and vote, or mixed the two methods. However, one of the primary findings was that the addition of the extra buttons to the interface increased the overall visual complexity to the degree that older voters found the machine intimidating. Even individuals who were able to discover and use the voting the system successfully commented on the fact that it looked complicated. Different strategies were explored to address the problem of visual complexity and cognitive load. First, any unnecessary labeling was removed. Secondly, an icon showing how the card should be inserted in the side (to initiate voting) was removed and instead put into an illustration on the screen. In this fashion the card image would be present when it was necessary to insert the card, but was otherwise not visible. The greatest reduction in complexity, however, was achieved by removing the tactile button set that allowed non-visual voting from the bottom edge of the display. 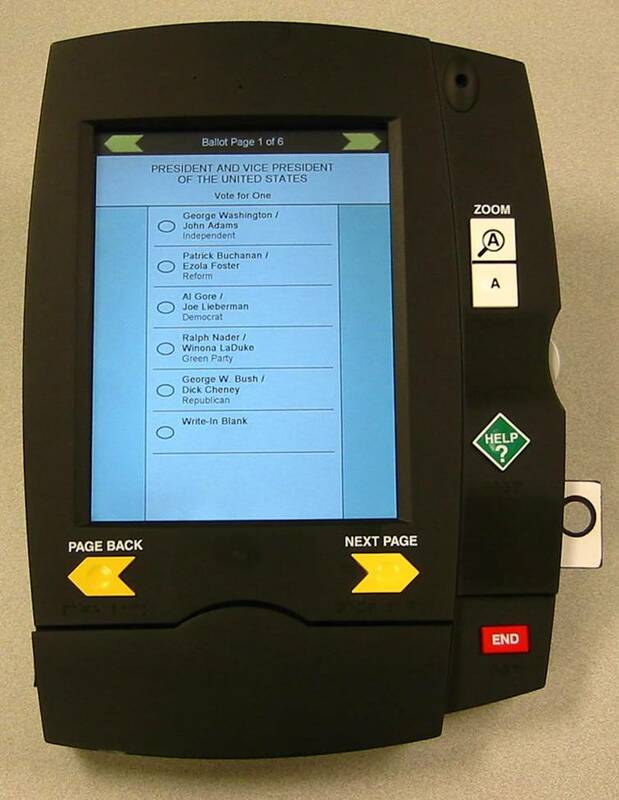 The result, shown in Figure 3, was a voting tablet with an interface that was visually much simpler. Only the buttons for turning the pages, the zoom and help buttons, and the button to skip to the end remain. The tactile page turning buttons were retained because of their easy reach, the fact that they were much more salient and obvious than the onscreen buttons, and because some older voters were not used to the idea of on-screen buttons. Caption: Current Design of Tablet Voting Machine that allows use by mainstream voters and most people with disabilities. A separate button pad (Figure 4) was designed that would work as an accessory to the voting tablet for individuals who were unable to use the touch screen for voting. This button pad allowed individuals to be able to turn through the various pages, move up and down through the choices, vote, and jump to the end in the same manner as the main set of controls. Even the help button was replicated so that the entire voting process could take place using the button pad. This pad could be held in the hand, placed on the table or placed in the lap. Caption: Keypad that attaches to Electronic Mainstream Vote Machines to allow voting by those who cannot use the primary means. Use of the separate button pad provided two benefits. First, it allowed the main unit to remain visually and operationally simple. Removing the extra buttons from the standard unit also reduced questions from voters who were not sure what the difference was between voting by touching the screen and voting using the buttons. Second, it allowed individuals who are blind to be able to explore the buttons and use them confidently without accidentally touching a nearby touch screen and causing some inadvertent action (a problem we encountered with the original all-in-one design). Finally, it avoided the need for any modal operation (such as turning off the touch screen when the buttons began to be used), which might cause confusion for those who used a button and then tried to use the touch screen, only to find that the screen no longer worked. A key breakthrough in the research occurred when we thought to add audio enhancements to the mainstream voting experience. Initially, when we moved the buttons to a separate pad, we ended up moving a significant portion of the voters off of the standard touch screen voting approach and onto the button pad. This included voters who are blind, voters who had low vision (and needed to have the names read to them), voters who had any type of reading problem, voters who could not recognize an ethnic name by its spelling and needed to have it pronounced, as well as voters who needed to use the buttons because of physical inability to reach or accurately touch the screen targets. However, by changing the operation of the touch screen to add "voice confirm" and "touch to hear" features, most of these individuals could move back to voting using the main voting tablet. The "voice confirm" feature allows individuals to vote normally, but get voice confirmation. This eliminates any doubts about the accuracy of their vote. After putting on a pair of headphones, they vote in the normal, visual touch screen fashion. However, each time they mark a selection, they hear the name of the candidate they marked announced in the headphones. This feature allows individuals who think they are having no problem to easily detect any incorrect votes. If a "voice confirm" feature had been available on the infamous "butterfly ballot," for example, it is unlikely that people would have made the mistakes that were apparently made without having discovered the mistake and being given a chance to correct it. The "touch to hear" feature was created by separating each candidate area into two regions. One region is a large area surrounding the actual oval in which the vote mark or check mark appears. The candidate name then becomes a "touch to hear" area. With the "touch to hear" feature, the voter can touch any of the text anywhere on the screen and it will be read to them. They can touch the instructions on the top when they begin or at any time during the vote if they are not sure which race they are in or how many people they are allowed to vote for. They can then move down the ballot, touching each of the names and having them read. A human (rather than synthetic) voice is used so that names are pronounced properly. When the voter finds the name they desire, they simply touch the checkbox next to the name. When they touch the checkbox, a mark appears at the same time the "voice confirm" confirms the name and the fact that they have marked or unmarked that candidate. Similarly, on a ballot referendum, they can read through the ballot and go back and have sections reread to them as they desire. The combination of these auditory, visual, and cognitive features as part of the standard voting system allows individuals who are older to be able to use the main touch screen voting system. By putting on the headphones, they can receive confirmation that they are, in fact, voting accurately. If they have difficulty, they can easily and naturally use the "touch to hear" feature to look for and find the candidates they want to choose. The voter retains their independence and avoids the embarrassment and loss of privacy with regard to their abilities. Each race is shown on a separate screen. There are large arrow shaped buttons that are used by the voter to move back and forth through the races. Our testing has shown that these are highly discoverable, intuitive, and easy to remember. Touching any text, anywhere on the screen causes the text to be read through the headphones. Touching the oval next to a name causes a large, easily visible checkmark to appear and the name and the fact that it is marked to be audibly confirmed in the headphones. Touching a mark a second time causes the checkmark to be removed and an announcement to be made that it has been removed. All screen touches are debounced for approximately .75 seconds (on the same button). This built in "BounceKeys" feature eliminates any double activation due to tremor. A zoom capability is included for those individuals who may have low vision and may also be severely hard of hearing or deaf. Note: We used a full page zoom, but a selective zoom (where names that are enlarged as they are touched) could also be used. We have not yet tested the selective zoom approach to weigh its advantages and disadvantages. · A confirmation screen appears at the end of the vote, allowing the voter to review all of his or her choices. Overvoting is prevented by warning the voter if they attempt to vote too many times, and providing guidance on how to change their vote if they wish. Warnings are provided on undervotes whenever the voter has clearly explored the candidates on the page but is exiting the page before voting for the full number of candidates they are entitled to. The warning message gives them the option to go back to vote for additional candidates or to continue. The volume and the rate of speech may be adjusted at any point in the voting process to account for differences in difficulty of the material or the ambient noise. A separate keypad is provided, that can be placed in the lap, positioned near someone's head or any other position and that allows full control of the voting process (from the first page of the instructions through closing out the vote). The pad can be used in conjunction with either the visual display or the audio, or both. The optional keypad can be attached to any or all of the machines in the voting place. The keypad module also allows users to connect custom switches in a secure fashion. That is, individuals could connect sip and puff, joy stick and other simple switches to the keypad and have full access to the voting process without physically connecting themselves to the actual voting machine and without providing any access to a data path which could be used to do anything other than "push the buttons on the button pad" (i.e., nothing harmful). There is an introduction at the front, which shows voters how to operate the voting system and how to cast the vote. It has an optional example ballot where voters are asked to mark the choice (Planet Venus) and to change a choice (Planet Mars to Jupiter) in order to give them a chance to practice with the device and receive help if they have difficulty. These instructions can be skipped over or be made mandatory. The use of these types of enhancements is not restricted to this particular prototype. The "voice confirm" and the "touch to hear" functionality, as well as the keypad module, could be implemented on other electronic voting technologies, such as touch screens, other screen based techniques, and even full faced ballot voting machines. With the described enhancements on the main voting unit, we estimate that 99% of voters would be able to use the main touch screen unit. The remaining 1 % could use the units via the optional keypad. Keypad users would include individuals whose vision is not sufficient to allow them to see the position of text blocks on screen, who do not have sufficient reach or strength to be able to use the touch screen, and those who would use special personal switches plugged into the keypad. Importantly, EEU voting machines would allow all those whose abilities are fading with age to be able to gracefully move from voting with good vision and motor skills to voting with impaired visual, motor, hearing, and cognition in a gradual, graceful and natural way that preserves their independence and dignity. It also allows a large number of individuals with "invisible" disabilities to be able to vote without having to identify themselves or risking an inaccurate vote because they wish to remain anonymous. Although not the primary topic of this paper, it should be noted that the need for voter verification or even a voter verified paper ballot trail does not in any way preclude the ability to use electronic voting systems and EEU voting systems such as that described. For example, systems such as the one described could be used to print out a card which summarized all of the candidates chosen by the individual. This card could then be taken to an independent reader station, where it is optically scanned and counted. If the individual is not able to read the card themselves, they can feed the card into the reader and the candidates can be confirmed in large print and/or read to the individual. This can be done on the main counting unit or a separate unit. Electronic voting systems have opened up the opportunity to not only reduce the number of errors and rejected ballots (due to voter error), but they also have the potential to greatly increase the number of individuals who are able to accurately and competently vote in privacy. The work described here shows that it is possible to create mainstream voting systems which have their usability enhanced and extended such that they cover almost everyone, thus preventing individuals who may not know they have disabilities (or may not want to expose the fact that they have disabilities) from casting ballots with errors. Finally, it demonstrates the ability to use a simple keypad module to provide access to individuals who otherwise wouldn't be able to use even the enhanced mainstream voting technique. Kraus, L., and Stoddard, S., 1989. Chartbook on disability in the United States. Prepared for US Department of Education, National Institute on Disability and Rehabilitation Research. Washington, DC: The Institute. LaPlante, Mitchell P.1989 , Data on Disability from the National Health Interview Survey, 1983-85. Washington, D.C.: National Institute on Disability and Rehabilitation Research, 1988. National Center for Health Statistics (1994), Data from the National Health Interview Survey, Series 10, Number 188, Table 1, 1994. Vanderheien, G.C. (2002). Building Natural Cross-Disability Access into Voting Systems. Proceedings of RESNA 2002 Annual Conference. Vanderheiden, G. C. (2004). Using Extended and Enhanced Usability (EEU) to provide access to mainstream electronic voting machines. Information Technology and Disabilities E-Journal, 10(2).